As the Android ecosystem has grown, it’s become apparent that many Android users, some of our readers included, are splitting up into what I see as cliche cliques. Years ago, when I first started visiting Droid Life as just a reader, we all united behind a common goal. That goal was to essentially show iOS users that our seedling mobile OS was going to be awesome, one day running on the majority of smartphones throughout the world. After all, iPhone users were the apparent pompous elitists who poo-pooed anything other than iOS. It’s 2016 now, and wouldn’t you know, Android is massive. In late 2015, Google revealed that there were 1.4 billion Android activations to date across the globe, and undoubtedly, that number continues to grow each day. The issue is, not all of these activations are the same phone, or even close for that matter, while iOS activations are united by similarities with each phone released by Apple. Each year, the iPhone sees a slight hardware and software upgrade, and each year, the same people upgrade to it. It’s basically an ever-growing family of people with the same smartphone experience. On Android, the experience on each phone differs greatly, and because of this, Android users of one particular phone will see users of a different phone as an enemy. They will argue about specifications, hardware design, software updates, OEM skins, and the list goes on. 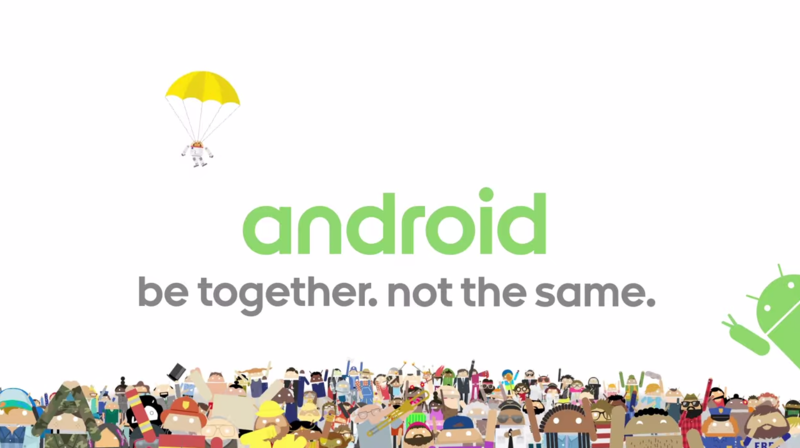 Recently, Google began a marketing campaign for Android, focusing on a simple, yet very powerful phrase – “Be together, not the same.” In my view, this sentence transcends that of just smartphone bickering, but relates to humanity in general. We may all be from different parts of the world and have different views, but we are all citizens of Earth. We are humans, together. All of us. With it attached to Android, Google could not have been anymore spot on with what Android represents as a whole. It stands for choice, options, and personal preferences. Each Android OEM brings something different to the table, whether it be better cameras, better displays, or certain software features you won’t find elsewhere. At the end of the day, people will buy whichever phone suits their own personal needs, not someone else’s. So while someone may smack talk Samsung’s TouchWiz or HTC’s black bar, we must remain respectful to other people’s choice. After all, they are your Android brethren. They are someone you can seek advice from when you need to troubleshoot an issue, or maybe even ask smartphone purchasing tips from. No matter the case, purchasing a particular brand of Android device (or any smartphone for that matter), should ever result in someone getting bashed for it. This is just unacceptable in my opinion. Let’s take a moment to remember that we are all enthusiasts of the same OS. Whether the version of Android you are running is skinned to oblivion or AOSP, it’s all the same on the inside.